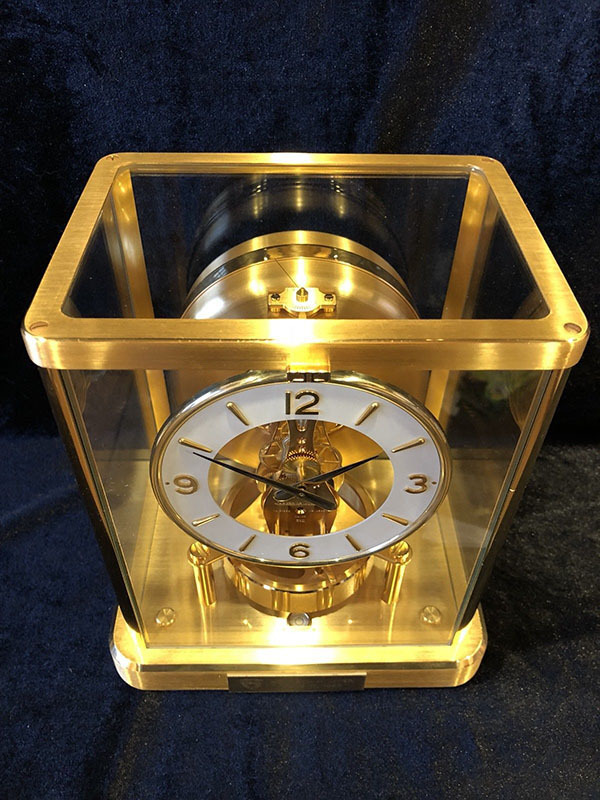 This clock is an ATMOS MODEL 540 Jaeger Le Coultre Clock. This clock comes from Switzerland and it has a serial number is 641062. This clock is a late 1980’s vintage piece of art. This particular clock is used but looks like new. 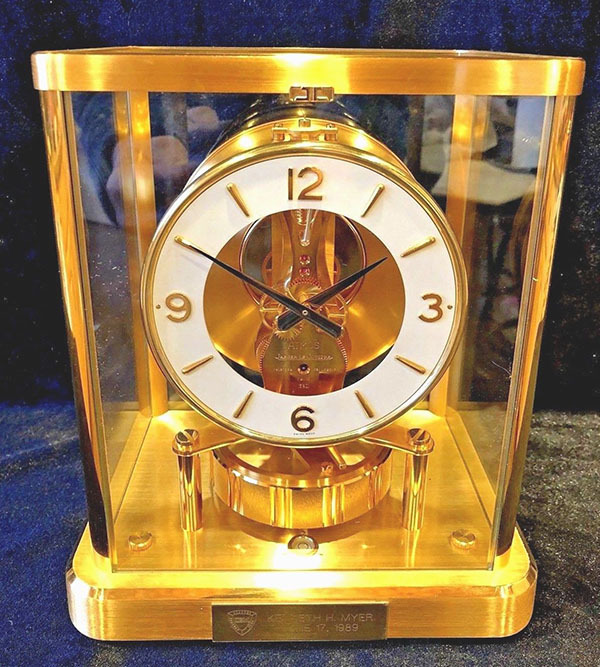 The clock has a 24-karat cold finish and is in excellent condition. There is minor wear and tear which would be a few scuffs, mainly on the bottom which is unseen to the eye when the clock is sitting. The clock has been a presentation clock and that is why there is a plaque on it. This however, can be removed. The clock is about 9 ½ inches tall and makes for a perfect piece on a desk or shelf. This particular clock does not guarantee accurate time but is beautifully made and makes for a great focal point of any room. Even though time is not completely accurate this can be easily fixed by a clock worker. Most of these types of clocks are set on shelves or desks in an office or high trafficked area because of its beauty. These clocks are known as mantle clocks because of their size and have been used recently on mantles in a house. This clock has almost no wear and tear or scuff marks. There is little to no wear and tear on this clock in particular. 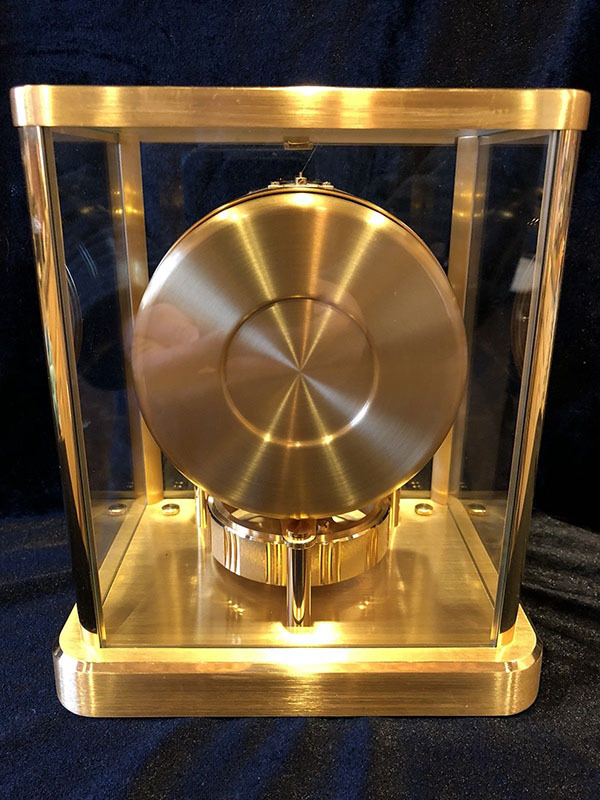 The beauty of this clock comes with its beautiful gold finish on the inside and outside of the clock. 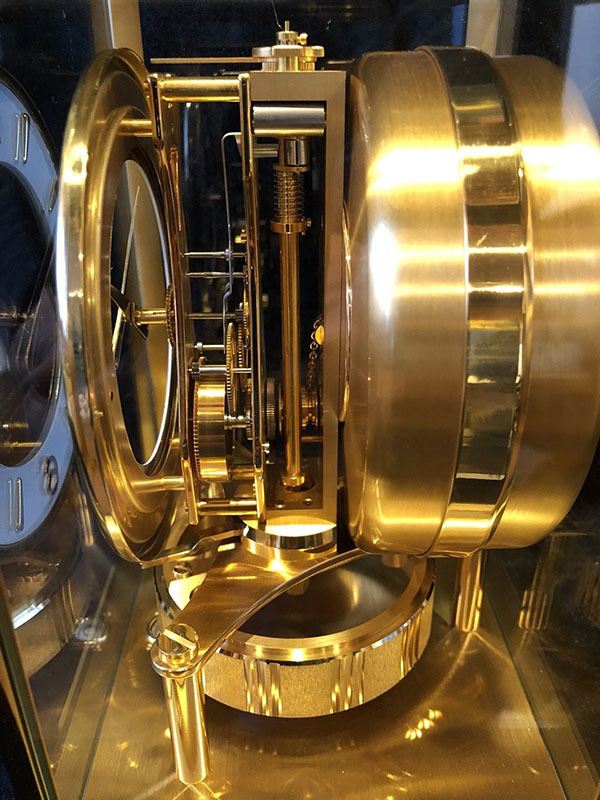 The mechanics of this clock are also having a gold finish that you are able to see through the clear glass surrounding the mechanics and dial of the clock. The hands are a deep black with the dial of the clock being white with gold numbers. The clock’s face or dial really pops due to its white background with black hands. With this clock being so beautiful it is also very fragile. The clock itself, including the mechanics of the clock, are surrounded by glass. This clock is very beautiful but also could break easily. There are many clocks like this out there to be seen, however, this clock is different than any other clock of this type because it still has all the glass intact and not broken. Many other clocks of this type have everything but the glass intact.